SAN FRANCISCO - December 22, 2014 -- Solid state storage technology provides an unmatched number of input/output operations per second, making it a powerful tool for content storage providers. As part of the 2015 Storage Visions® conference, Marty Czekalski, president of the SCSI Trade Association (STA), will highlight the advantages of using solid state disk drives (SSDs) in the enterprise and the role that the Serial Attached SCSI (SAS) interconnection standard plays in maximizing the capabilities of these devices. Continue reading SCSI Trade Association Discusses Advancements in Solid State Drive Technology at 2015 Storage Visions® Conference. SAN JOSE, Calif. and SINGAPORE, Dec. 10, 2014 (GLOBE NEWSWIRE) -- Avago Technologies (Nasdaq:AVGO) today announced expansion of its industry-leading family of 12Gb/s SAS host bus adapters (HBAs) by shipping new 16-port solutions. The new 9300-16i HBA will join the Avago family of high-port-count SAS HBAs. With the versatility of 16 ports using internal or external storage connectivity, 12Gb/s SAS bandwidth, and nearly 2 million IOPS of performance, the Avago SAS 9300 HBA family, which offers 4-, 8- and 16-port options, enables OEMs and system builders to deliver maximum connectivity for high-end servers and storage systems that exceed the most demanding requirements for data centers, web, and cloud. Continue reading Avago Expands Industry-Leading Family of 12Gb/s SAS Host Bus Adapters With New 16-Port Solutions. SAN FRANCISCO - December 2, 2014 -- Demonstrating that Serial Attached SCSI (SAS) technology delivers the performance and reliability required for enterprise-class storage, the SCSI Trade Association (STA) today announced the successful completion of its 16th SAS Plugfest. The fourth for 12Gb/s SAS, the event was held September 22-26, 2014, at the University of New Hampshire InterOperability Laboratory (UNH-IOL). Twenty one companies, including both STA members and non-members, participated. Continue reading Large Build Configurations of Storage Systems Using 12Gb/s SAS Data Interfaces Tested at SCSI Trade Association Plugfest Event. STA President Marty Czekalski and STA Vice President Greg McSorley gave a series of presentations at Powering the Cloud in Frankfurt, Germany in October 2014, including one presentation in the Storage Innovation Theatre and two shorter presentations in the Meet the Experts Theatre. This is an abbreviated version of the Storage Innovation Theatre presentation above. SAN FRANCISCO - October 20, 2014 -- Serial Attached Storage (SAS) technology is the critical storage interconnection fabric that rapidly became the storage interface of choice for servers and external storage products. During several presentations scheduled at the 2014 Powering the Cloud conference in the Messe Frankfurt Exhibition Centre October 28-29, leading storage industry experts from the SCSI Trade Association (STA) will discuss how SAS is uniquely positioned to deliver the Reliability, Accessibility and Serviceability required by the data center of today and tomorrow. Continue reading SCSI Trade Association Highlights the Important Role SAS Plays in Servers and External Storage Products at 2014 Powering the Cloud . SUNNYVALE, Calif., September 17, 2014 - PMC-Sierra, Inc. (PMC®) (Nasdaq:PMCS), the semiconductor and software solutions innovator transforming networks that connect, move and store big data, today announced the company is first to ship 16-port 12Gb/s SAS and 16-port 6Gb/s SATA I/O controller solutions. PMC's data center I/O products enable OEMs and ODMs to design cost-effective customized server hardware for hyperscale deployments, such as Open Compute, Windows Cloud Servers, OpenStack and Project Scorpio. The devices have the industry's highest port density, lowest power and are capable of more than 1,000,000 I/Os per second to support the most demanding cloud software applications. Continue reading PMC Delivers Industry's First 16-port SAS and SATA Storage Controllers for Data Center Servers. On September 16, STA President Marty Czekalski presented an update on SCSI standards and technology at Storage Developer Conference in Santa Clara, CA. Avago Technologies (NASDAQ: AVGO) today announced its advanced lineup of 12Gb/s SAS storage solutions has been chosen to power more than 250 new server models based on the recently announced Intel® Xeon® processor E5-2600 v3 product family. Leading server manufacturers have selected Avago 12Gb/s SAS and MegaRAID® solutions to provide the field-proven technology demanded by next-generation server platforms that run data-intensive applications. Continue reading Avago Advanced SAS Storage Technology Powers Over 250 Next-Generation Server Models Using New Intel Xeon Processors. SUNNYVALE, Calif., August 26, 2014 - PMC-Sierra, Inc. (PMC®) (Nasdaq:PMCS), the semiconductor and software solutions innovator transforming networks that connect, move and store big data, today announced the industry's first 12Gb/s SAS expander card to enable density-optimized servers, the fastest growing segment of the worldwide server market according to IDC1. 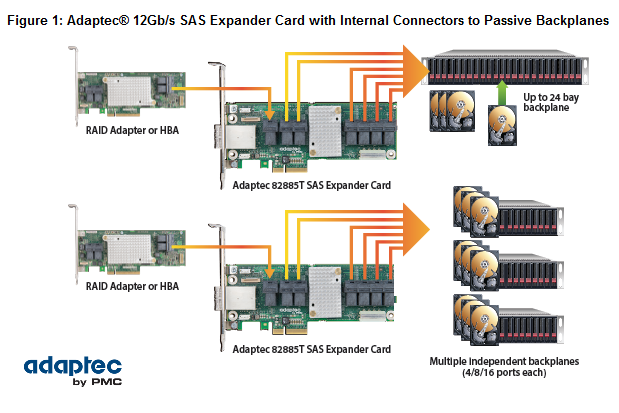 The Adaptec® 12Gb/s SAS expander card enables flexible, high-density server architectures that can expand as data center storage needs grow. It provides 36 ports in a PCI Express® (PCIe®) low-profile form factor, with internal connectivity for up to 24 SAS or SATA drives and eight additional external ports to connect JBODs for even greater capacity expansion on a single RAID controller or Host Bus Adapter. The expander card enables modular passive backplane architectures to reduce server variants and increase data center operating efficiency (see Figure 1). Continue reading PMC Enables Density-Optimized Data Center Servers with Industry's First 12Gb/s SAS Expander Card. During a panel presentation at Flash Memory Summit in Santa Clara on August 6, 2014, leading storage industry experts from STA discussed the challenges of distributed storage systems and how the SAS storage protocol is uniquely positioned to handle the mixture of workloads and I/O demands required. The panel was moderated by Jeff Janukowicz, research director at IDC. Flash Memory Summit, Santa Clara, CA August 5, 2014 - Teledyne LeCroy, a worldwide leader in serial data test solutions, has upgraded the SAS Verification suite to support Serial Attached SCSI 3.0 (12Gb/s) solid state drive (SSD) and hard disk drive (HDD) testing. Available as a software option for the Sierra M122/M124 protocol analyzer platform, the suite provides an automated, turnkey test application that allows storage developers to screen devices for conformance to the SAS 3.0 specification. Continue reading Teledyne LeCroy Upgrades SAS Verification to Support 12 Gb/s Solid State Device (SSD) and Hard Disk Drive (HDD) Testing. SAN JOSE, Calif., July 28, 2014  HGST, a Western Digital company (NASDAQ: WDC), today announced its next-generation of Ultrastar® 12Gb/s SAS solid-state drives (SSDs) with capacities up to 1.6TB. Building upon its award-winning first generation 12Gb/s SAS SSDs, the new Ultrastar SSD800MH.B, Ultrastar SSD1600MM and Ultrastar SSD1600MR are the ideal building blocks for server and storage systems running today's performance-sensitive enterprise applications. Continue reading HGST Expands Enterprise SAS SSD Storage Portfolio for Data-Intensive Application Acceleration. SAN FRANCISCO - July 29, 2014  As more enterprises begin to adopt hyperscale computing systems to meet big data analytical needs, scale-out storage and scalability is increasingly in the spotlight. During a panel presentation scheduled at the 2014 Flash Memory Summit, leading storage industry experts from the SCSI Trade Association (STA) will discuss the challenges of distributed storage systems and how the Serial Attached SCSI (SAS) storage protocol is uniquely positioned to handle the mixture of workloads and I/O demands required. Continue reading SCSI Trade Association Highlights the Important Role SAS Plays in Scale-out Storage Solutions at the 2014 Flash Memory Summit. SAN JOSE, Calif., July 9, 2014  HGST, a Western Digital company (NASDAQ: WDC), today announced that it is now shipping the world's highest capacity and highest performing 10K RPM hard disk drive (HDD) - the Ultrastar® C10K1800. Based on HGST's field proven high-quality design, the 2.5-inch small form factor (SFF), enterprise-class Ultrastar® C10K1800 combines high capacity with a significant improvement in both random write and sequential performance for mission-critical storage applications requiring 24/7 availability. Continue reading HGST Ships Highest-Capacity, Highest-Performing 10K Hard Drive for Mission-Critical 24/7 Data Center Applications. LISLE, IL - June 17, 2014 - Molex Incorporated announces the launch of its new comprehensive iPass+™ High-Density Interconnect System, comprised of host-side board connectors, internal and external copper cable assemblies and Active Optical Cables (AOCs) capable of transporting SAS 3.0, 12 Gbps signals in lengths up to 100 meters. The enhanced iPass+ HD system is designed and engineered to meet the new performance standards for speed and density. Continue reading Molex iPass+™ High-Density Interconnect System is Ideal for Large-Scale Storage. MILPITAS, Calif. April 30, 2014 - SanDisk Corporation (NASDAQ: SNDK), a global leader in flash storage solutions, today announced the Optimus MAX Serial Attached SCSI (SAS) solid state drive (SSD), the industry's first 4TB1 SAS SSD. The Optimus MAX SSD achieves a capacity point that far outpaces today's highest-capacity 2.5" 10K and 15K rpm SAS hard-disk drives (HDDs), making it the first true replacement for legacy mission-critical data center SAS HDDs. Most notably, the Optimus MAX SSD delivers SAS performance and functionality at a breakthrough price point that was previously only available in SATA-based SSDs. The Optimus MAX SSD tops the newly refreshed Optimus® SAS SSD family and also joins the company's newly announced Lightning® Gen. II 12Gb/s SAS SSDs, extending SanDisk's entire SAS portfolio to cover the performance, capacity and endurance needs of a wide array of enterprise applications. Continue reading SanDisk Unveils World's First 4 Terabyte Enterprise SAS SSD. MILPITAS, Calif. April 30, 2014 - SanDisk Corporation (NASDAQ: SNDK), a global leader in flash storage solutions, today announced the Lightning® Gen. II family of enterprise-class 12Gb/s Serial Attached SCSI (SAS) solid state drives (SSDs). The Lightning Gen. II 12Gb/s SAS SSDs, together with the newly announced Optimus MAX™ 4TB1 SAS SSD and updated Optimus® SSD product family, help businesses meet the performance, uptime and capacity requirements across the wide range of mixed-use, read- and write-intensive application workloads common in today's data centers. Continue reading SanDisk Delivers Increased Performance for Mission-Critical Applications with Lightning Gen. II SSD Product Family . IRVINE, Calif. - March 3, 2014  The Storage Products Business Unit of Toshiba America Electronic Components, Inc., a committed technology leader, announces new additions to the enterprise capacity hard disk drives (HDD) - the AL13SXB and the self-encrypting AL13SXQ. With a 2.5-inch form factor, the AL13SXB and AL13SXQ have 15mm z-height and spin at speeds up to 15,000 rotations per minute (RPM), making the AL13SX series suitable for mission critical enterprise storage applications. Continue reading TOSHIBA Announces Next Generation 15,000 RPM Enterprise Performance Hard Disk Drives . SAN JOSE, Calif., February 26, 2014 - HGST, a Western Digital company (NASDAQ: WDC), today announced that it is shipping a new family of high-performance, high-capacity, 2.5-inch small form factor (SFF), 15K RPM enterprise-class hard disk drives (HDD) - the Ultrastar C15K600 family. Delivering best-in-class performance and capacity in one streamlined solution, the new Ultrastar C15K600 family enables higher density and higher performing servers, blades and network storage arrays all while reducing space requirements, lowering cooling costs and improving total cost of ownership (TCO). - See more. Continue reading HGST Ships Fastest, Highest Capacity 15K RPM 12Gb/s SAS Hard Drives for Mission-Critical 24/7 Applications. SAN FRANCISCO  February 11, 2014  Announcing its newly elected Board of Directors for 2014, the SCSI Trade Association (STA) recapped a year of significant milestones and looked ahead to continued advancement and innovation of the proven and predominant SCSI data storage standard. Continue reading SCSI Trade Association Announces 2014 Board of Directors; Foresees Continued Advancement of Predominant SCSI Data Storage Standard. SAN FRANCISCO - February 4, 2014 -- In a move that punctuates the importance of technical standards including interoperability, investment protection and improved quality for end users, the SCSI Trade Association (STA) today announced the T10 Technical Committee completed and forwarded the first version of the SCSI Express specifications to the InterNational Committee on Information Technology Standards (INCITS) in November 2013. The SCSI Express specifications include the SCSI over PCI (SOP) and PCI Express (PCIe) Queuing Interface (PQI) technical standards. Continue reading SCSI Trade Association Announces Completion of First Version of SCSI Express Specification, Advancing Performance and Innovation of Enterprise Data Storage . 2013 is the previous archive. 2015 is the next archive.